The Glock 40 M.O.S. is a newest offering by Glock to hit the shelves. Chambered in the powerful 10mm and outfitted with the Modular Optics System, there is little this behemoth can’t do. This is a review that I have been very anxious to bring to ya’ll. It has been in the works for some time now, and to finally have it ready is exciting. I finally got my hands on a Glock 40 M.O.S. in 10mm Auto for reviewing purposes. The Glock 40 M.O.S. was the prom queen at the 2015 SHOT show convention in Las Vegas. It was known that Glock was going to unveil an optics mounting system on their pistols in a bid to compete with other manufacturers, but it was thought by those in the know that it would be only be on the tactical/practical/ competition pistols, e.g. Glock 34, 35, 41, etc. That all did come to pass, but what surprised the gun industry was that enormous long-slide black pistol in 10mm Auto with the same optics mounting system. Enter the Glock 40 M.O.S. The Glock 40 M.O.S. is essentially, with a few differences, the classic Glock 20 Gen 4 save for a 6”barrel and slide. The M.O.S. (which stands for Modular Optics System) is a removable plate system on the slide just in front of the rear sight. The pistol comes with a blister pack of four different plates that when attached to the pistol slide, allow the mounting of the shooter’s preferred optic, e.g C-More, Trijicon, Leupold, etc. The pistol, which is too big for an IDPA box, is geared toward the hunting market. The 10mm is not really a feasible plinking and competition round (unless you are bloody rich and a glutton for punishment), and has found a niche in the backwoodsmen and hunters who like the hot rod performance and high capacity the 10mm offers. For years, the Glock 20, with its service length 4.6” barrel has worked fine. Here you can easily see the plate mounting system on the slide secured by two allen head screws. The classic Glock adjustable rear sight is also plainly seen. However, in some states a 6” barrel is required to hunt big game with a pistol. Glock has sold an aftermarket 10mm 6” barrel for their models 20 and 29 for years, but it looked kinda goofy with that extra inch and half or two sticking out from the end of the slide of a service size Glock 20. The added velocity from the 6” barrel was noticeable, but you were stuck with the same stock sight radius. The Glock 40 fixes that issue, and then some. Upon opening the box, I could see that Glock is really an expert at space saving. That little plastic box was crammed with that big pistol, three magazines, a mag loader, cleaning brush, sight adjusting tool, gun lock, 4 additional back straps and beavertails, extraneous paperwork, and owner’s manual. Once I took everything out, I couldn’t close the box again so I had to repack it with just the essentials. Since this pistol is so new on the market, (they just started shipping in August, and there is a huge backorder) there really isn’t much in the way for holsters. I found that just about anything that will fit a Glock 20 will fit the Glock 40, as long as you don’t mind that barrel poking out past the end. The pistol comes crammed into a neat plastic box with a ton of accessories. The pistol, despite the size, is rather lightweight and very well balanced. Unloaded weight is 28 ounces, and with a loaded 15rd magazine is roughly 41 ounces, or about the weight of an unloaded 1911 Gov’t. I figure that big pistol would be nose heavy, but it actually points just fine. The long slide and barrel also serve to help control muzzle flip, but we will get to that part soon. The pistol has adjustable Glock sights, which I specifically requested. They are a plain and unassuming affair, mirroring the whole pistol in styling and function. The grip is quite a doozy. I have average sized hands, I would say. Getting a grip around the Glock 40 is very trying. I am also, admittedly a 1911/HiPower fan boy, so the Glock grip angle is very foreign to me. I have to use all of my hand to really get a good grip in order to control it during shooting. There are 15 of those long 10mm bad boys in the mag and as such, it creates a very large grip. The 4 replaceable back straps and beavertails are going to be, at least in my version, unusable, because all they do is make the large grip even larger. The slide release, is in typical Glock fashion, very small and difficult to release. I have long since trained myself to “slingshot” a pistol slide when loading and shooting, so it doesn’t bother me much, but I can see where it would be a issue for other shooters. The trigger is, in my opinion, a refined version of their standard trigger. Glock makes no mention of it in any literature as being any different than the 5.5lb trigger on any of their other pistols, but it feels so much smoother to me. The take up is standard, until you feel a slight bit of tension. Upon applying a few pounds of pressure the trigger will release. The reset is absolutely gorgeous and is mere millimeters from the breaking point. All you have to do is let your finger out a scoche and the very discernable click of the trigger resetting is heard. Rinse, repeat. The place where this pistol really shines is the range. I have plans to take it on the 100 yard rifle zero range, but for now we will see how she does on the standard 25 yard pistol range. Recoil is stout, it is not as sharp as 45ACP+P loads, but there is a lot of muzzle flip and torqueing in the grip. The ammo I used was American Eagle, RAM Precision, and the brand new SIG Elite Performance. All ammo was 180 grain full metal jacket, except for one box of the RAM which was 150 grain hollow point. 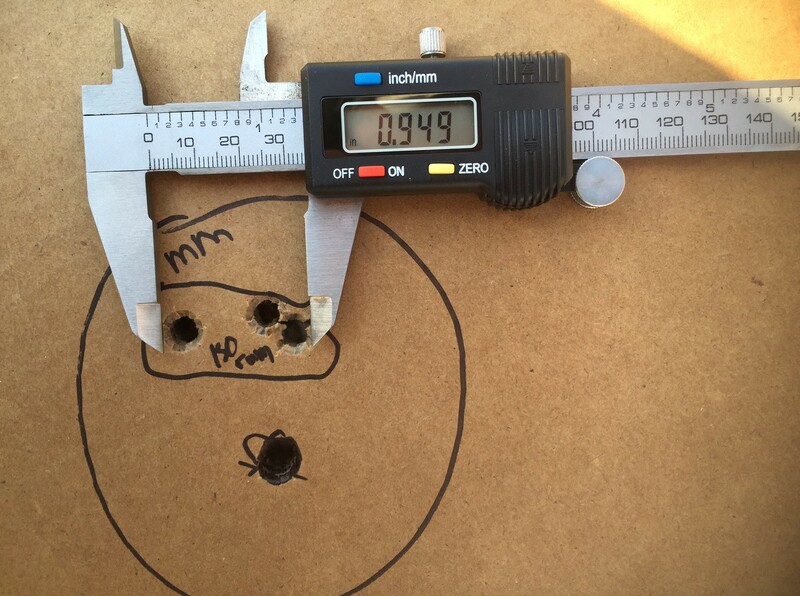 This sub inch grouping shows the inherent accuracy of the pistol and cartridge. The black dot served as an aiming reference. The American Eagle was junk, plain and simple. It was loaded to .40 S&W levels and wasn’t very accurate. It produced about 4.5” groups, but I didn’t really measure them. The RAM Precision 180 grain FMJ was printing groups half that size. But again I wasn’t overly impressed. The RAM 150 gr HP and the SIG 180gr FMJ is where the money was made. I was able to produce two groups each with both types of ammo that grouped at or under an inch. Yes. You read that right. 3 shot groups at 25 yards under an inch. I thought it was a fluke the first time, until I did it three more times. Now, I am not some wiz-bang wünderkind shot. Neither am I lying or exaggerating. I don’t get anything extra for being dishonest. I simply focused on the front sight, calmed my breathing and executed a good trigger squeeze. Upon taking up a good Weaver stance and engaging in rapid fire at 25 yards it was very easy to keep all 15 of those big pills in the 9 ring of a B-27 target. As for longer barrel = higher velocity, I was getting about 5-6 percent higher velocity than was advertised. So, for the SIG Elite Performance ammo, which was advertised at 1250 fps and 624 ft lbs of energy, I was getting readings on my chronograph in the ~1315 fps and 690 ft lbs range. That is, in my opinion, a substantial gain that equates well to the person who buys this for hunting or backpacking. I am still looking for some hot, heavy Underwood ammo to run through it, but until then, the SIG ammo works just fine. As for the optics situation, I have never had optics on a handgun, and I am not sure I wanna fork over several hundred more dollars for a sight that I may not like. It shoots and handles great without one so far, so I think I will leave the slide and rails free of impediment.